Document Protection for Excel (Excel Document Protector) converts Excel files to an secure encrypted format to prevent editing, copying and printing of copyright and confidential Excel content for distribution. 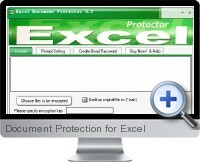 Document Protection supports all Excel file types including XLS, XLSX, XLW and CSV. Non-binding - Any computer with one password. PC binding - One computer linked to the machine ID with one password. Executable - Convert the Excel file to an EXE application to prevent copying, editing and printing of its content. End users are prompted for a password when opening the encrypted file. If the password is linked to the machine ID, then the machine ID can be communicated to the distributor and a password generated and issued limiting access to the document content on a computer by computer basis.